As a Valentine’s gift for your partner, Animal Defenders International (ADI) is offering the chance for readers to adopt one of their rescued animal couples saved from terrible suffering, who have now found happiness and companionship. 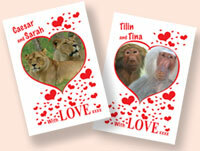 ADI’s special Valentine’s day “Loved Ones” adoptions feature two lions called Caesar and Sarah and two baboons, Tilin and Tina. Sarah and Caesar the lions were saved from a life of torment in a Portuguese circus by ADI and are now seeing out their days in peace and tranquillity in Africa. Their ADI enclosure of natural bush is almost twice the size of Wembley which they roam together, always at each other’s side.